If permissions allow, Committee Managers can set custom evaluation criteria for rating applicants on a five-star scale. It is also possible to set up a "blind review" in which Evaluators will not see the comments and ratings left by others. 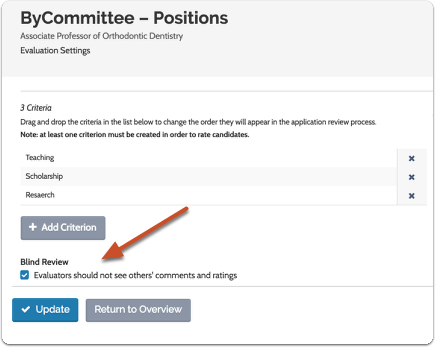 Custom ratings criteria and/or a blind review can be set during the process of creating a position, or when editing a position. The directions below explain how to add criteria and set a blind review when editing a position. 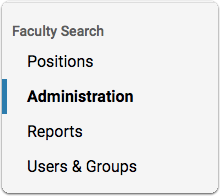 If evaluators comment during a blind review, and the blind review setting is turned off, then evaluators associated with the search will be able to see summary information but not specific results. If users with the proper permissions want to see ratings by the evaluator that they will need to run an applications report.